I was lucky enough to connect with Stacy Fisher of Fisher Fitness (http://www.fisherfitness.com) for one of her Melt Method classes (http://www.meltmethod.com) while in Jackson, Wyoming. 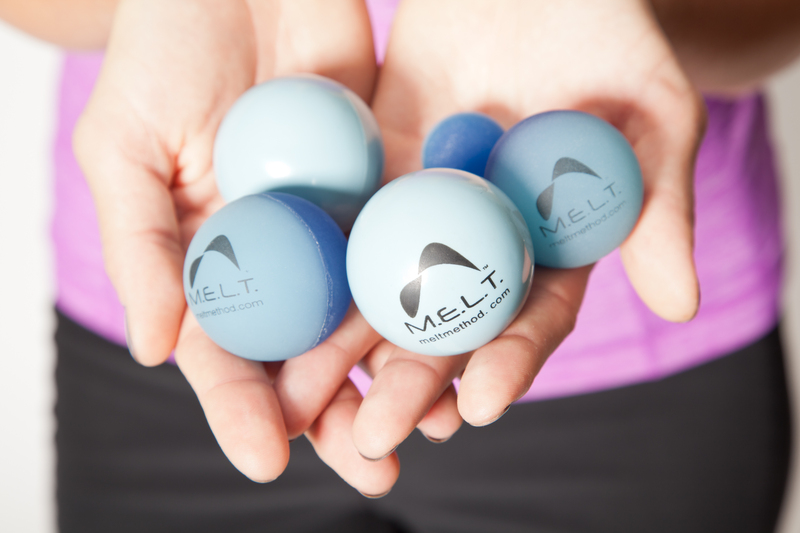 I had never heard of Melt Method and was eager to experience something new. I arrived to the studio to find people sitting on the floor on their yoga mats and a long body roller beside them. As is my usual reaction I started getting anxious. When I was working out with my trainer David he had us roll ourselves on foam rollers, something that I always thought looked awkward and difficult, I always opted for the Tiger Tail Massage stick. I let those other people roll around on the ground while I quickly rolled myself out while standing. Looks like I was going to finally have to get down and dirty and actually foam roller. Stacy started the class with a warm welcome and instructed us to do a self assessment of our bodies. This involved us getting a sense of how our feet were grounded as well as laying down and getting an idea of how our bodies pressed against the floor. She then asked us to grab two small rubber balls, one about the size of a bouncy ball and hard, the other essentially a softer tennis ball. We ran through various pressure points with the balls underneath our feet, many people had extreme discomfort, I actually tolerated the pressure quite well. I have struggled with Plantar Fascitis in the past and felt for those who were feeling the pain. We then moved on to our hands and retested our connection and flexibility, it was amazing how much difference those simple movements made in my stance and finger flexibility. We then moved to the floor to do the body work. When I did my self assessment the weight of my left side against the floor in comparison to my right was the most notable. Stacy instructed us to sit on the foam roller and to be honest my first concern was I was going to squash my roller flat, thankfully that didn’t happen and my anxiety lessened. We started rolling ourselves every which way on this roller, closing our eyes and focusing on our movement. I was surprised that I wasn’t embarrassed about rolling around on the floor and I actually found it quite relaxing. Once we were done rolling ourselves we reassessed our bodies and it was a remarkable improvement, my body laid more evenly, more natural. The entire class was an hour and I enjoyed every moment in the room. I look forward to learning more about Melt Method and I hope to incorporate this into my own routine. Stacy offers both private training as well as group Melt Method and Belly up to the Barre. Q. Why did you become a strength coach? A. I was actually on the career path to becoming a Physical Therapist. I went to the University of Wisconsin-Eau Claire and majored in Kinesiology-Exercise Science. As our final Senior semester, we were assigned real clients to train three times a week. I immediately fell in love with personal training, although I did not like getting up early in the morning! It also helped that my first client was a total gem…an overweight yet flexible, positive and strong willed man. He did whatever I asked and he actually became healthier and I became confident in my abilities as a trainer. I was amazed that I could have that positively affect another human’s life. That was 2004 and I have continued to evolve as a trainer, always keeping in mind the excitement I felt working with him. Q. How do you customize your program to adapt to different fitness levels? A. Every session is customized to my clients, every day. I adjust not only for different fitness levels, but also based on how they are feeling that day, what activities they did in the days prior, etc. There are many factors that go into creating a workout. People are dynamic and therefore it is impossible to plan a workout too far in advance. Living in a very healthy, active community like Jackson I usually have to work around my clients’ outdoor pursuits. This means I spend more time trying to correct dysfunctions caused by their sports. I feel fortunate that I can focus on corrective exercise and less on motivating my clients to stay healthy on the days I am not working with them. Mostly I pick a theme…say posterior chain strength and length or scapular stabilization, etc. I work in little a different manner than most personal trainers. I share space with Excel Physical Therapy and therefore I work in a rehabilitative manner, but also incorporating more functional full-body movements than physical therapy allows. Q. What do you do in your community to stay in shape outside of the gym? Q. Do you have a success story you are most proud of? A. No. I feel that I have little mini-successes each day, either with my own professional development or when a client achieves a small or large goal. The last four years I have dedicated a majority of my work toward getting my clients to “Restore More”. We exercise a lot in Jackson, some people bordering on exercise addiction. I strive to get people to focus on restoring and hydrating their bodies through a new self-care technique called The Melt Method. I first discovered it at a fitness conference and it completely changed my outlook on the human body. It created profound changes not only in my body, but in my clients as well. I became the first Melt Method Instructor in Wyoming in 2009, so I guess that is one title I hold with pride. Q. What is your favorite workout soundtrack or song? A. I have a Spotify account, which is fantastic, albeit a bit overwhelming with all the choices out there. I make countless playlists for my classes…my clients say they like my music. I hope they are not just being nice! I try to incorporate all genres, because my clients range from 25-80 years old. I cannot play Beyonce all day as my older crowd gets tired of that pretty quickly! We had our first live DJ Belly up to the Barre Party recently. Working out with a live DJ was unbelievably motivating! I know I was working harder than ever before because I was SORE the next day! I am already looking forward to our next party in a few weeks. Q. What is your most embarrassing gym moment? A. I am truly a clutz. I hit my head on everything. I am not sure how I can be so balanced while working out and yet have terrible spatial awareness. They say that most accidents in the gym happen when you are not actually doing an exercise. I can confirm that is true. I have almost knocked myself out on the squat rack (a few times) by bending over to pick something up and whack! stood up right into the side bars. I have also been hit in the head by a medicine ball (my client threw it at me when I was not looking). I cannot say I was embarrassed because I was too busy seeing stars.